Losing someone you love is always devastating, but the pain is made that much worse when your loved one was just a child with their whole life ahead of them. It is also infuriating when you discover you’re your child may have died as a result of careless driving by another individual. A prime example is a tragic accident that occurred on State Road 821. A vehicle being driven by a 17-year-old and carrying two 14-year-old passengers, slid off the exit ramp to Allapattah Road and onto the shoulder. The driver tried to correct the steering but wound up colliding with two palm trees, according to the Miami Herald. The 14-year-old passenger sitting in the front seat died from his injuries. The other 14-year-old passenger suffered serious injuries, but is in stable condition as of the date of this posting. Deepest condolences go out to the parents of the teenager who had their life come to an end far too soon. Losing someone you love, especially a child, can decimate a parent and/or sibling. The mental anguish and trauma associated with this type of sudden loss is difficult to fully comprehend. Many parents never fully recover emotionally or psychologically from the death of a child. A Miami wrongful death attorney will put a jury in your shoes to ensure they get a sense of the incredible pain and sorrow that a family endures when they lose a loved one due to the careless actions of the defendant. 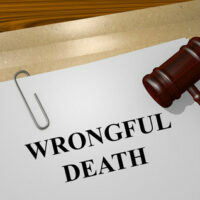 Wrongful death damages generally include economic and non-economic damages. Economic damages include medical bills, funeral expenses, and future earnings of the victim. When a claim involves the death of a child, calculating future earnings can get complicated since a number of assumptions have to be made (e.g., would they have graduated from high school and gone on to college, what type of profession did they want to go into, etc.). This is why hiring an experienced Miami wrongful death lawyer is important because they can retain the services of skilled economists who can put together a rough calculation of what someone would have reasonably earned had they not lost their life in an accident. In addition to economic damages, there are non-economic damages. These damages include mental anguish and psychological trauma associated with the sudden loss. In many instances, people refer to non-economic damages as pain and suffering damages. It is the emotional injury people suffer after a preventable accident that claims the life of a loved one or results in a catastrophic injury. In certain circumstances, you could pursue punitive damages against the defendant. These are damages meant to punish the wrongdoer for their reckless and wanton behavior. But keep in mind, the evidence must show truly shocking or egregious behavior in order for a plaintiff to pursue punitive damages. In addition, Florida limits the amount of punitive damages that can be awarded to three times the amount of compensatory damages or $500,000, depending on which is greater. The Miami lawyers at the office of Alan Goldfarb, P.A. are here to help you through this difficult time. Our firm is comprised of AV-rated attorneys who are recognized for their skill and ability in the courtroom. Contact our office today to schedule a free, confidential consultation.